Entering some bars is like entering a different universe. In this particular case I felt like stepping into a time machine and moving back 30 or 40 years in the past. 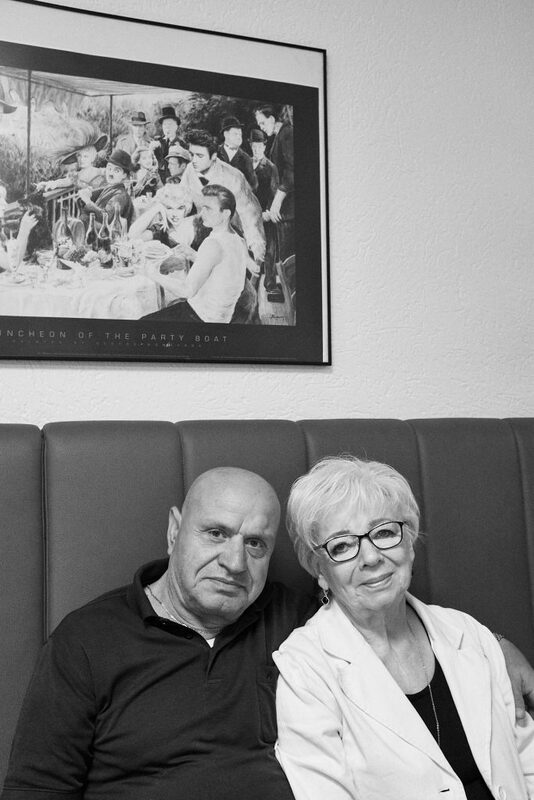 The bar reflects a lot the age of its customers, mostly italian immigrants who moved to Germany in the ’70s. Younger people also gravitate around it, but mostly hang outside, while in the inside the older guard uses it as an informal point where to meet, play cards, have a drink before going home. 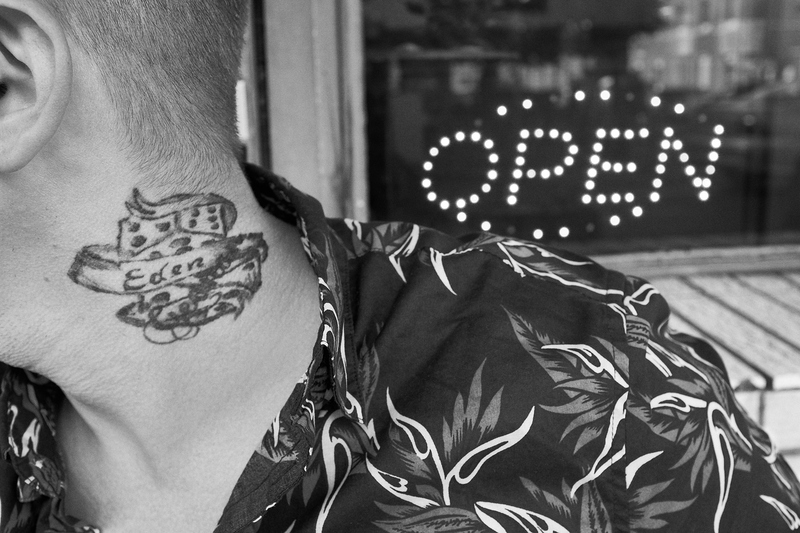 A young man shows his tattoo while sitting outside the bar. 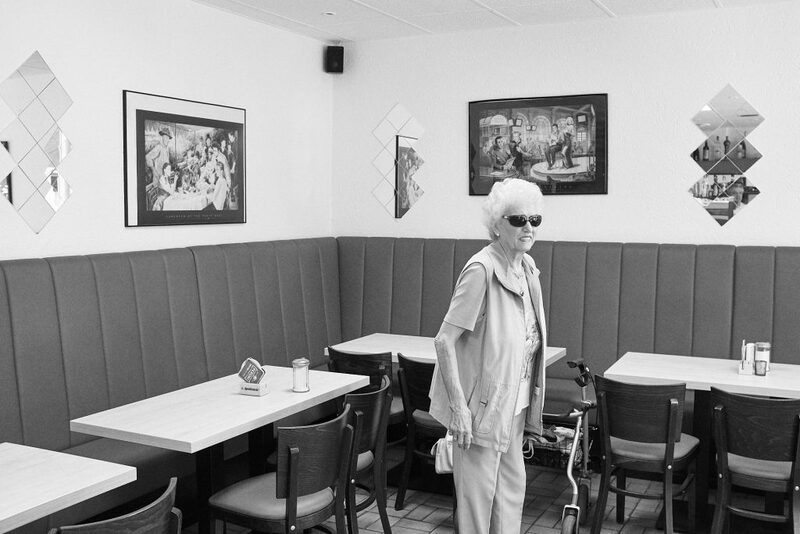 A woman parks her walking frame next to a table and stands to order a drink. Duesseldorf, Germany, 2018. 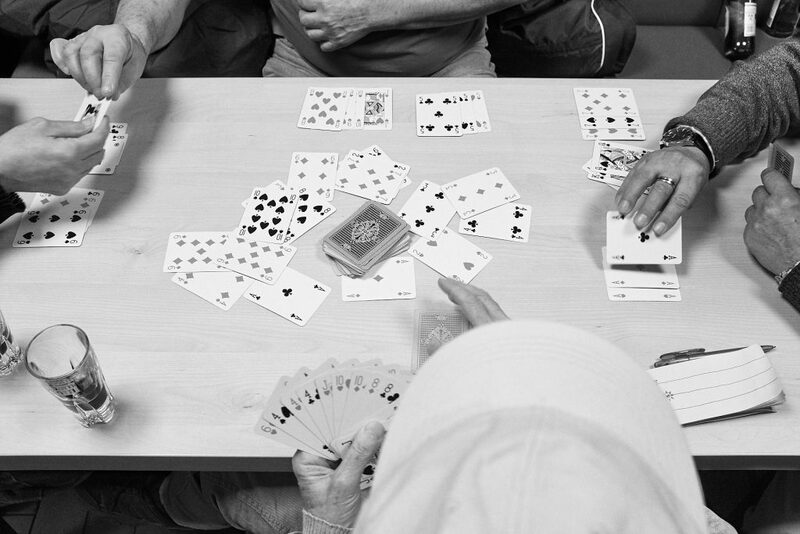 Men play rummy in the back of the shop. Duesseldorf, Germany, 2018. Hands of men playing rummy. Duesseldorf, Germany, 2018. 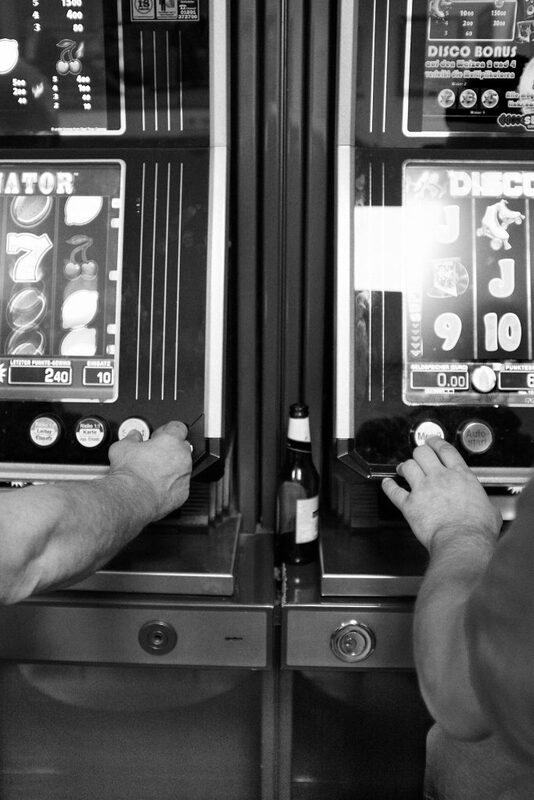 Two men try their luck on the slot machine. Duesseldorf, Germany, 2018. 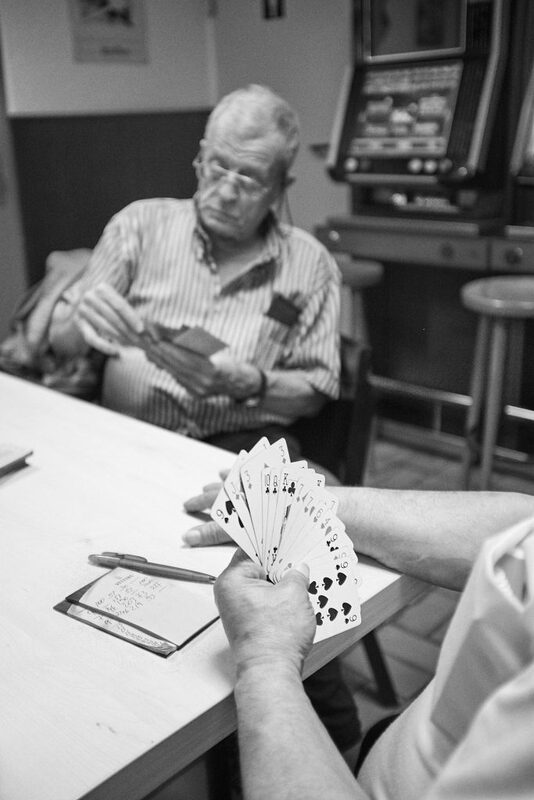 A man plays solitaire with Neapolitan cards and invites his friend for a match of "scopa", a card game played mostly in southern Italy. Duesseldorf, Germany, 2018. A woman glances outside the bar. Duesseldorf, Germany, 2018. 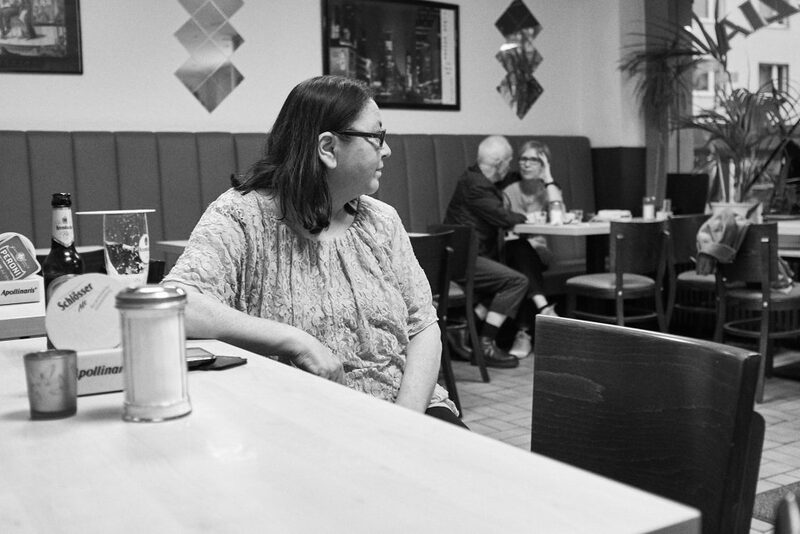 Two customers pose for a photo. Duesseldorf, Germany, 2018. 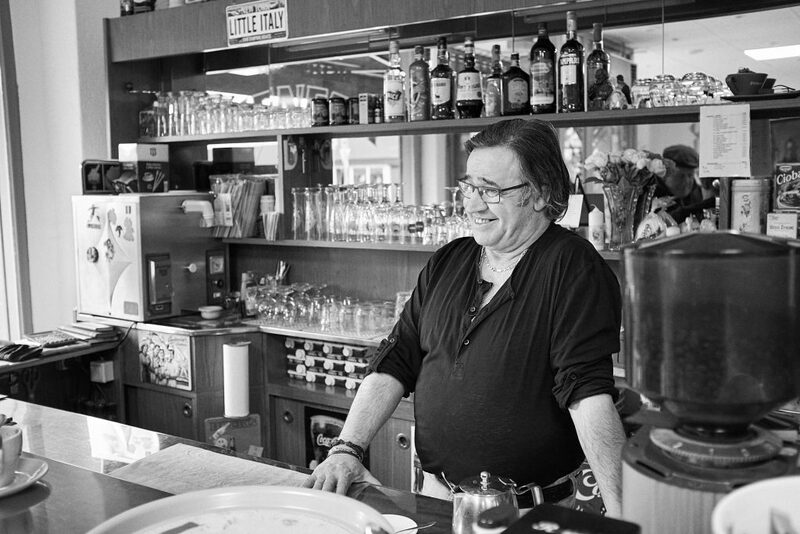 The owner of the bar makes jokes with his guests. Duesseldorf, Germany, 2018. 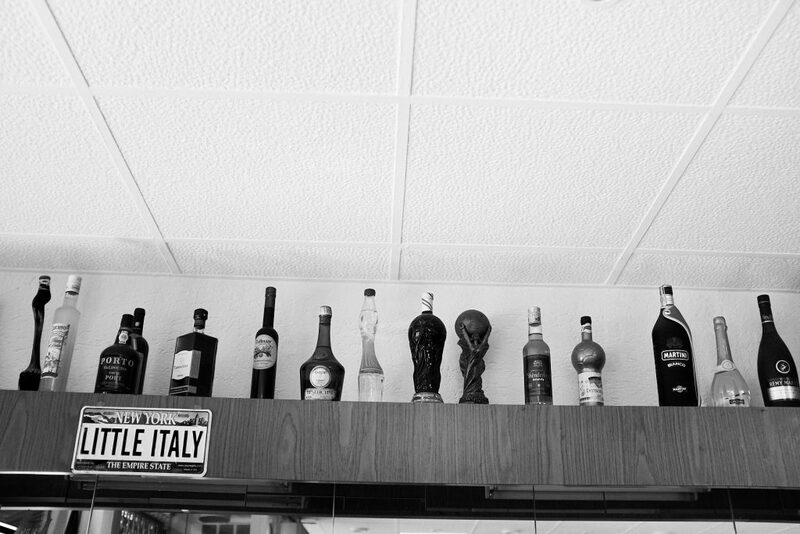 Bottles lined up on the top of the counter. Duesseldorf, Germany, 2018. 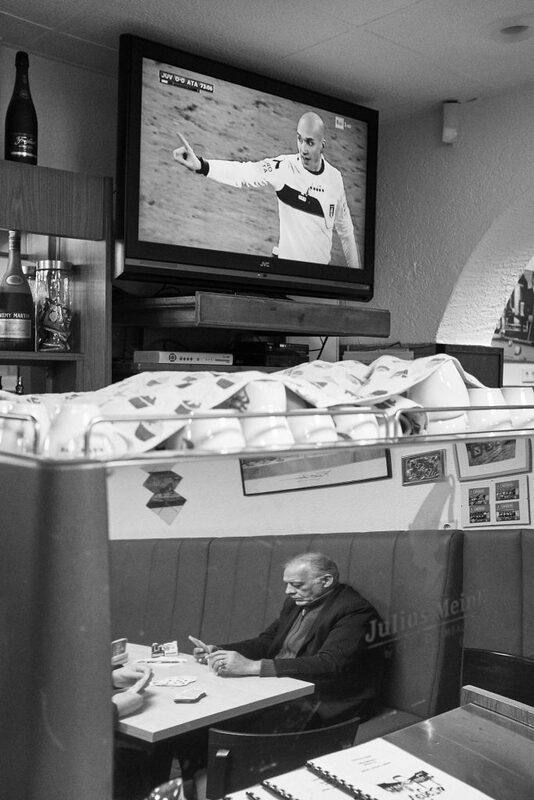 A man playing cards is reflected in a coffee machine while a football match goes on on TV. Duesseldorf, Germany, 2018. 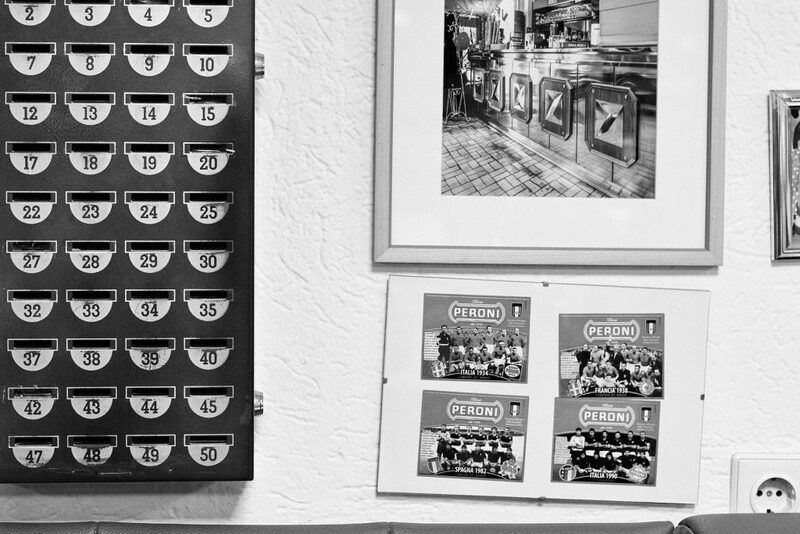 Some old photos and postcards of the Italian football team hang on the wall. Duesseldorf, Germany, 2018. 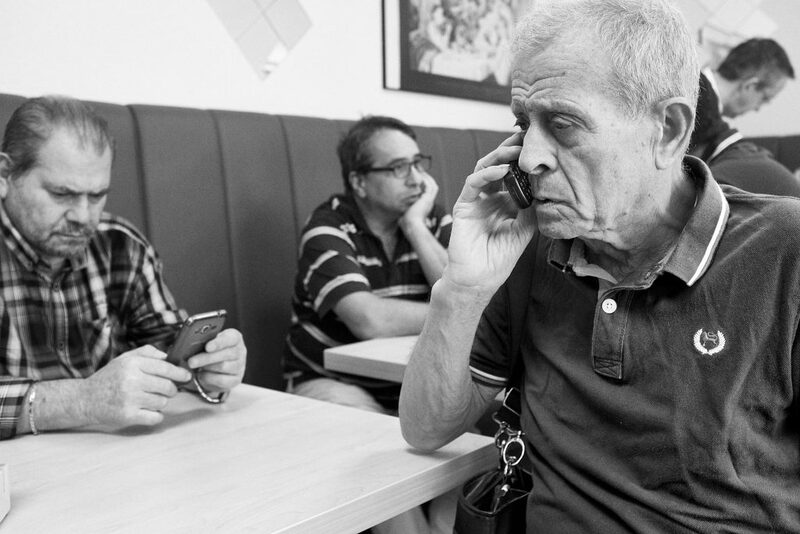 A man makes an international call on the telephone to consult his lawyer about his inheritance. Duesseldorf, Germany, 2018. 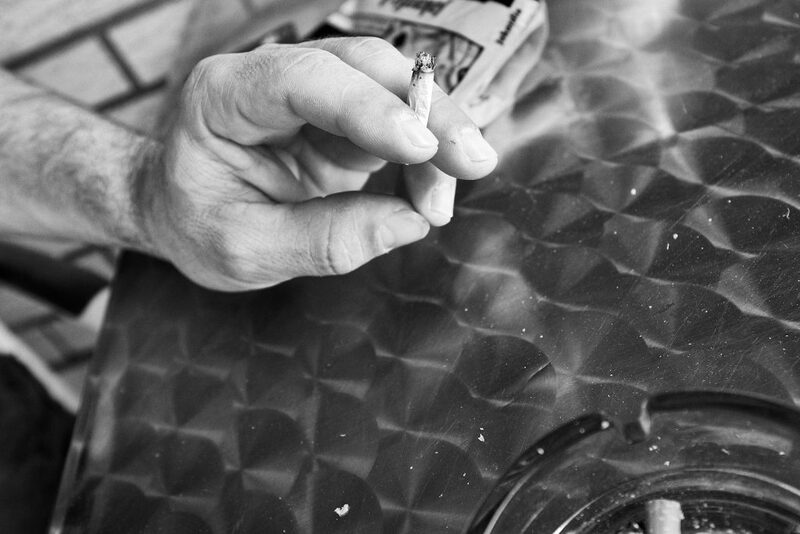 The hand of a young man smoking a cigarette. Duesseldorf, Germany, 2018. 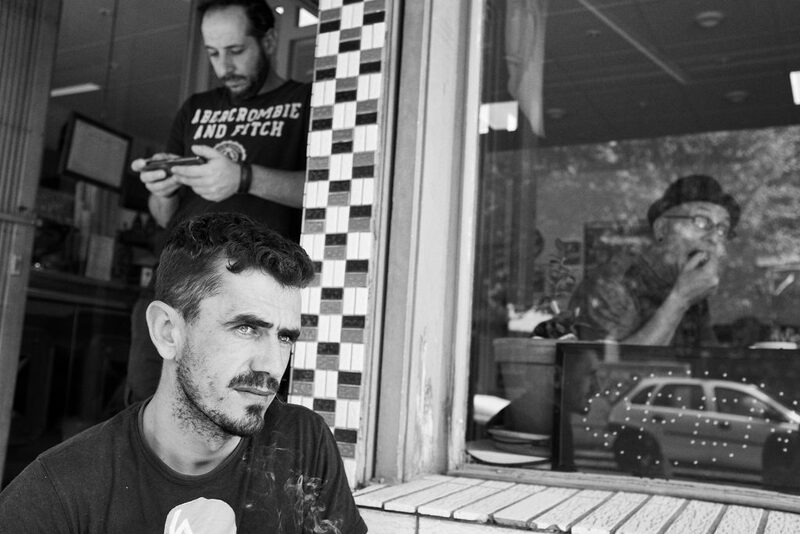 A man sits outside and smokes a cigarette while drinking an espresso coffee; other customers are busy with their own stuff. Duesseldorf, Germany, 2018. 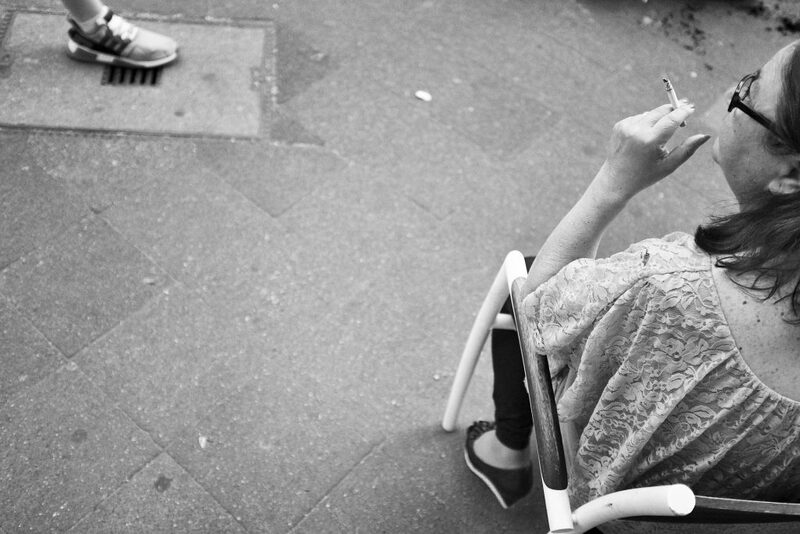 A. sits outside and smokes a cigarette as the day moves towards its end. 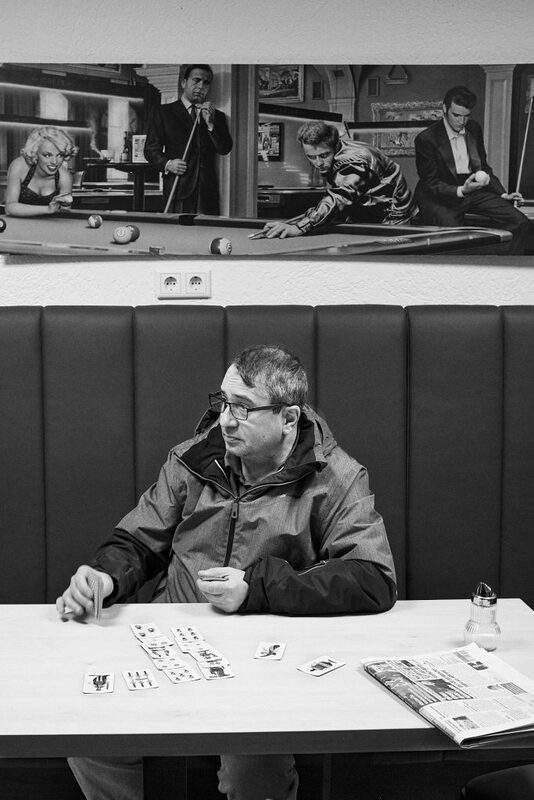 Duesseldorf, Germany, 2018.